Some famous and popular Bengali Books of Premendra Mitra. 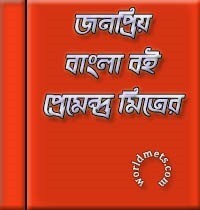 Popular Bengali Books of Premendra Mitra as ebook pdf. Premendra Mitra was a renowned bengali poet, Novelist, film director, thrillers and story writer. He is one of the most famous traders of science fiction in own article by Bengali language. He was born 1904 in Varanasi and died on 3rd May,1988 in Kolkata. He wrote lots of Novels, essays, Science fictions, Ghost stories, Fun stories, Characters, Teenager stories, Short stories, Child stories and Poems. His first published work was Shudhu Keranee in March 1924 in popular bengali journal Probasi. and his popular story Gopon Charini in second published in this journal. Readers you can get some unpublished poems and translated poems from the Premendra Mitrer Shreshtha Kabita. His first Poetry Book Prathama was published in 1932. Revolutionary cognitive and Humanity is the main feature of his poetry.The three books of his short story Panchasar, Benami Bandar and Putul O Pratima were published in his early life. Premendra Mitra was unique in his autobiography, expressing the broken relationships of human, the complexity of mind, the pain of middle-class and pain & suffering of low-incomers. He gets lot of awards are Rabindra puraskar, Sahitya Academy Award, Shishu Sahitya puraskar, Ananda puraskar, Nehru Award, D Lit from Bardwan University in 1981, Vidya sagar Puraskar, Deshokottam from Visya Varati on 1988, Padmashree etc.. Ghanada is a most popular fiction character in Bangla literature which was created this character by Premendra Mitra on 1945. His some popular various type of books as pdf free download from this page below. Prathama Poetry Book by Premendra Mitra. Premendra Granthabali by Premendra Mitra. Premendra Mitrer Nana Range Bona by Premendra Mitra. Some popular various type of books as pdf of Premendra Mitra. Wonderful collection. Thank you a lot. Many many thanks for your valuable comments.